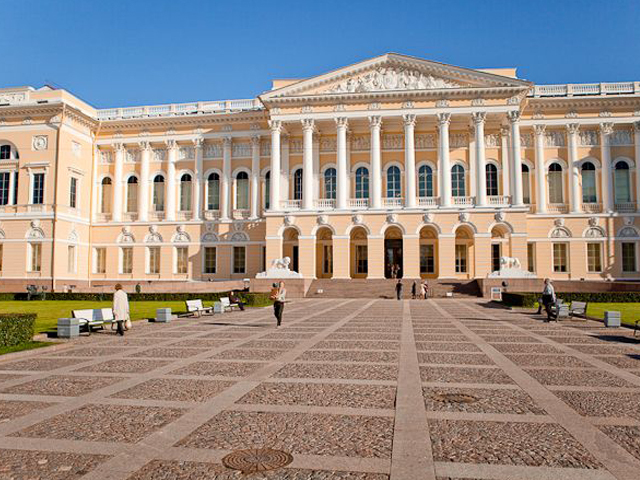 St. Petersburg's Russian Museum was established in the late nineteenth century by Emperor Nicholas II as the first state museum of Russian fine art. 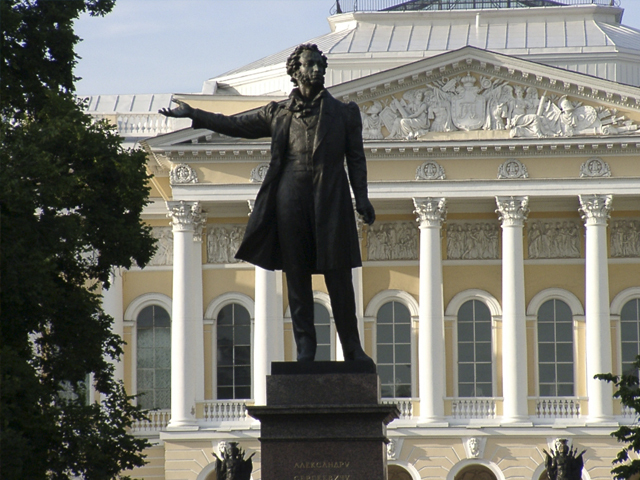 Most of its vast collection is displayed in the Mikhailovsky Palace. Monday: 11.00 a.m. - 18.00 p.m.
Tuesday: 11.00 a.m. - 18.00 p.m.
Thursday:	11.00 a.m. - 18.00 p.m.
Friday: 11.00 a.m. - 18.00 p.m.
Saturday: 11.00 a.m. - 18.00 p.m.
Sunday: 11.00 a.m. - 18.00 p.m. In 1895, Tsar Nicholas recognized the need for a public art exhibit that would bring regional masterpieces to the people of Russia. Choosing the Mikhailovsky Palace to house the museum the tsar gathered a variety of genres at the museum, including oil painting, sculpture, graphic art, decorative and applied art. The original collection numbered 445 pieces, most of them coming from the Hermitage Museum, the Royal Palaces and the Academy of Arts Museum. The museum collection continued to acquire items from the Academy of Arts, and after the Revolution important pieces from palaces and private collections also moved to the Russian Museum. 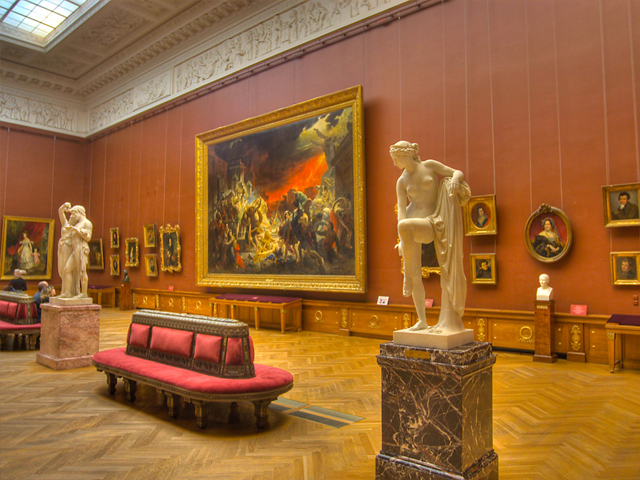 Today, there's 400,000 works in the permanent collection, covering the entire history of Russian fine art. 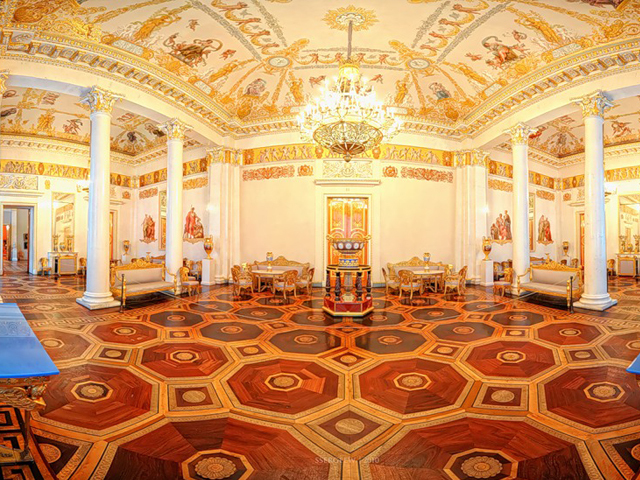 The museum also currently serves as the coordinating center for all art museums in Russia and has been extended to include three more palaces in St. Petersburg - the Stroganov Palace, Marble Palace and St Michael's Castle. The Mikhailovsky Palace was built for the Grand Duke Mikhail Pavlovich, the younger brother of tsar Alexander I. It was constructed to the design of Carlo Rossi between 1819 and 1825 and is considered a masterpiece of Russian Neoclassical architecture. The palace was acquired by the crown in 1895 and the interior was renovated in order to accommodate the museum. Most of the original exterior design of the palace is still intact. A wide staircase flanked by lion statues leads to the large portico with eight Corinthian columns that dominates the front facade of the building. The interior however, has undergone more drastic changes, with only the Main Staircase and the grand White Hall retaining Rossi's original design. The White Hall even has the original furniture in place. Inzhenernaya St, 4, St Petersburg, Russia.